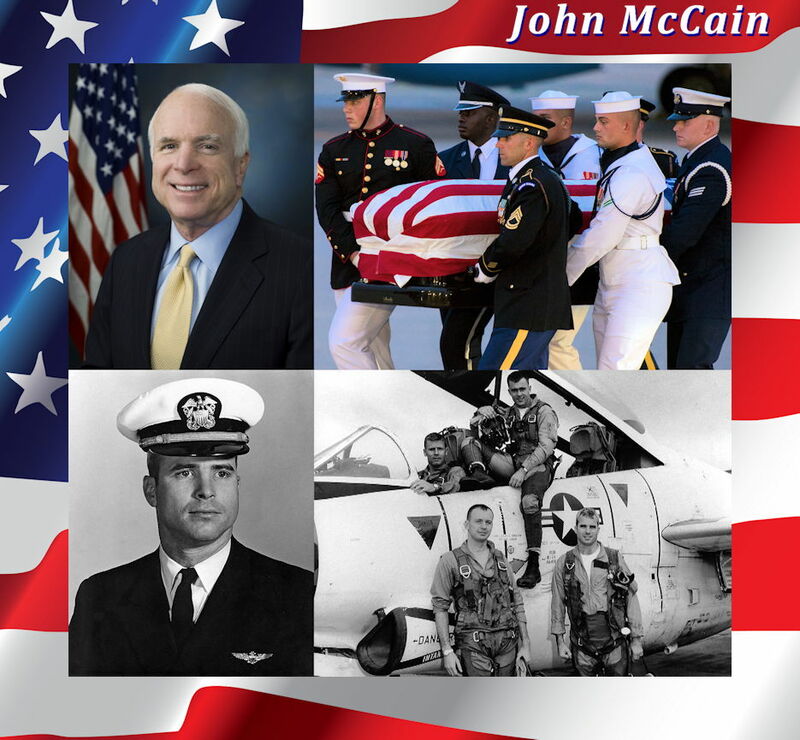 John McCain - Honorable U.S. Senator and Decorated Navy Veteran - USA Patriotism! USA Patriotism! salutes U.S. Navy veteran Senator John McCain for his dedicated duty to our beloved USA during his decorated military service and elected leadership tenure! John McCain III graduated from the United States Naval Academy in 1958 and was commissioned into the United States Navy. He became a naval aviator and flew ground-attack aircraft from aircraft carriers. During the Vietnam War, he was almost killed in the 1967 USS Forrestal fire. While on a bombing mission during Operation Rolling Thunder over Hanoi in October 1967, he was shot down, seriously injured, and captured by the North Vietnamese. He was a prisoner of war until 1973. He experienced episodes of torture and refused an out-of-sequence early repatriation offer. The wounds that he sustained during the war left him with lifelong physical disabilities. In 2015, he became Chairman of the Senate Armed Services Committee, where he continued his strong support of the military services, troops, and veterans until brain cancer in 2017 forced him to reduce his role in the Senate to focus on treatment. He remained a U.S. Senator until the brain cancer took him on August 25, 2018 shortly before his 82nd birthday. USA Patriotism! is a nonpolitical, nonpartisan organization and site including its social media channels. John McCain is saluted for his military and elective service to the USA ... not his political positions and actions for or against any subject and/or individual. And while every American has the right to agree and disagree on John McCain's political and other actions ... political and derogatory comments are not allowed at the USA Patriotism! site and its social media channels. Political and derogatory comments will be removed ... They can be expressed elsewhere as allowed. A glimpse of John McCain's feelings about the United States of America!